In one of my last posts I talked about collections preservation surveys, a few good reasons to have one, and about writing a grant proposal to fund a survey. In this post I’ll discuss how a survey of photographic collections went in my institution and how we approached the survey report once it was complete. In 2009, I helped draft a proposal to the National Endowment for the Humanities to secure a Preservation Assistance Grant for Smaller Institutions for my tiny archive. If awarded this $6,000 grant, we would pay for a preservation survey of our photographic collections by a consultant from the Northeast Document Conservation Center in Andover, MA. The survey would include a site visit and overall examination of the collections by a trained conservator, who would write up a report about the state of the collection with recommendations about what should be done to help preserve them. The grant would also support the purchase of photographic storage supplies and storage furniture for slides and oversized photographic prints. The proposal deadline was in May, and we were awarded the grant in January of the following year. Hurray! We set up a date for the preservation survey right away, and got to work researching supplies to rehouse some of our collections. Pro tip: sign up to receive promotional emails from the big archives supply vendors like Gaylord Archival, Hollinger Metal Edge, and University Products. You’ll soon see about how often they have sales and you can stretch your grant dollars even further. What’s It Like to Have A Collections Survey? 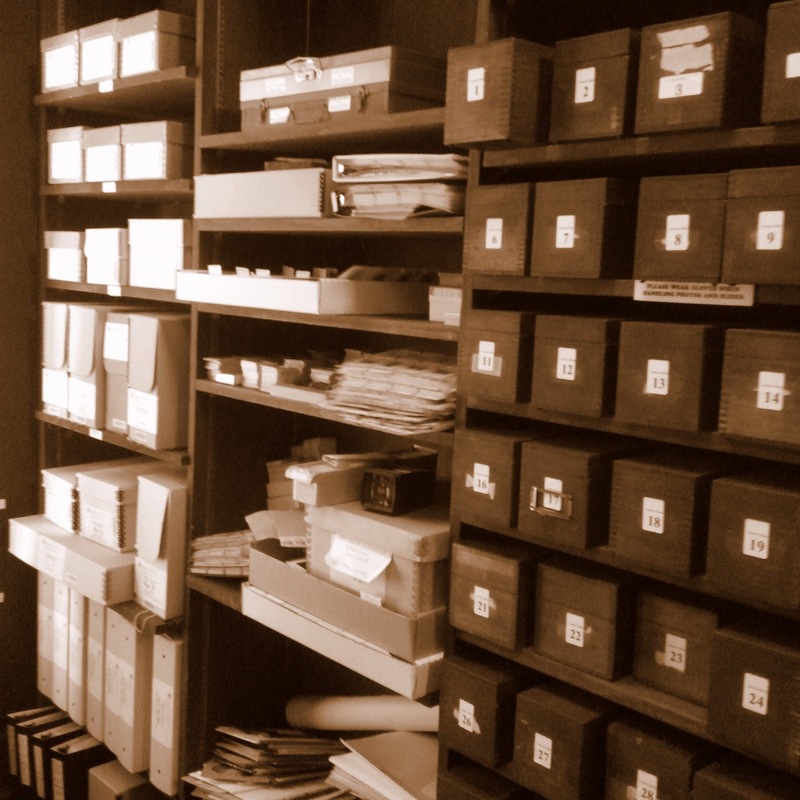 Our surveyor spent the better part of the day in our Archives, which are located all in one room - collections storage, office space, reading room, work area, and at that time a super annoying kitchenette (long story). As I mentioned in my earlier post, I knew deep down a lot of the major problems surrounding our collection storage and use techniques, but it was incredibly helpful to have them all dragged out into the light. This is no time to be embarrassed about how your institution is or to underplay problems. Answer every question fully, honestly and to the best of your ability - there will be a lot of them! Getting everything down on paper is actually better for you going forward, especially in using them to tell funders about what you need next. In our case, we had major issues. Not only was our documentation of the collections poor at the time, but our lack of proper storage conditions was putting the collections at high risk of deterioration and making them difficult to handle. One researcher, in a letter of support for our project said that doing research in our Archives was like archaeological excavation. Photographic prints were stored willy-nilly, stacked in boxes on wood shelving or in a file cabinet of hanging folders, under loosely categorized subject headings. Everything seemed a bit too crowded. From my first year in the Archives I had occasionally discovered loss and damage due to past incidents of stacking slides or crowding too many prints into a box. A full overhaul of the storage scheme was long overdue. Our Archives were located in a charming set of 1830s row houses on Boston's Beacon Hill, one block from the Massachusetts State House. Despite its location in one of Boston’s most famous historic districts, the facility was showing the infirmities of old age and lacked many modern amenities like decent climate control. Forced-air heat was use in winter and a single, anemic air conditioning unit barely kept the space bearable in summer. Humidity would fall into the low 20s in the dry winter and can leap up to 62% on hot summer days. Temperatures ranged from 58 to 90 degrees Fahrenheit. (I had these numbers to share with our surveyor ‘cause I was recording the data!) These conditions caused visible curling, drying and cracking in photographic prints and negatives, making their surfaces weaker with every passing year. After the survey day and a few follow-up questions we had our report in hand. At first it seemed overwhelming. Everything about our Archives looked wrong. Too hot! Too dry! Walls need to separate storage from people! Everything should be stored differently! Well, yeah. And this is where I hear the collective groaning a lot of Lone Arrangers and tiny archive folks. We’ll never be able to do all of these massive, high-price-tag things! No, it’s not going to change overnight, and there are some things you won’t be able to do for a long, long time, but you have to start somewhere. And that survey report is a great way to break things down into a road map. A great way to get organized is to break things out of the report that work as small, freestanding projects and line them up by feasibility. Can you afford a few supplies to rehouse just one collection this year? Great, put that at the top and start there. Did your report say you should have UV resistant plastic on all of your windows? Seem doable in the next couple of months? Even small accomplishments like this can set the stage for success and help you build momentum. Our first priority was dictated by the extra grant money we had for storage supplies, followed by a million other small and large things on the list. We used our survey report to get a small portion of our collections out of their old boxes and into some fancy new digs. All it took was a little planning, one massive shopping session (yessss! ), an intern or two, a simple spreadsheet, and time. While working on other followup projects, we waited around for a few years before we found a grant that would allow us to purchase a plain old air conditioner to cool our space just a bit better and a refrigerator in which to store our films and negatives. It’s all about patience and taking things one little step at a time. Check back here next month for a detailed write up on rehousing photographic print collections on a shoestring! Have you had a preservation survey? How did it go? What advice would you give for setting one up and what questions should we ask our surveyors? Give us some tips and share your experience in the comments section below!